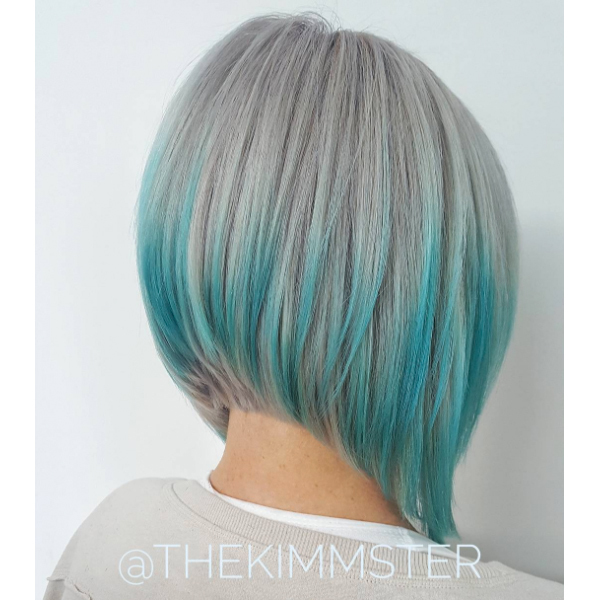 This bold color melt from Kimberly Torres (@thekimmster), a master stylist at Kut Haus Salon in Covina, Calif., is perfect for clients who are looking for “something subtle, but statement-making.” And when this smoky gray to electric teal color melt got more than 14k likes on our Insta, we knew we had to get the deets. Check out the how-to below! Start by applying Formula A to the regrowth area. Process for 45 minutes. Rinse, then blow-dry until the hair is 100 percent dry. Apply Formula B to the roots and midlengths only. Then, apply Formula C to the ends and blend the color up into the midlengths. Process for 30 minutes. “I left out a horseshoe section in the nape and left that section silver,” says Kimberly. Rinse with very cold water and condition only. Do not shampoo the hair.